There’s something magnificent about being a tiny human surrounded by 1000 year old giants. 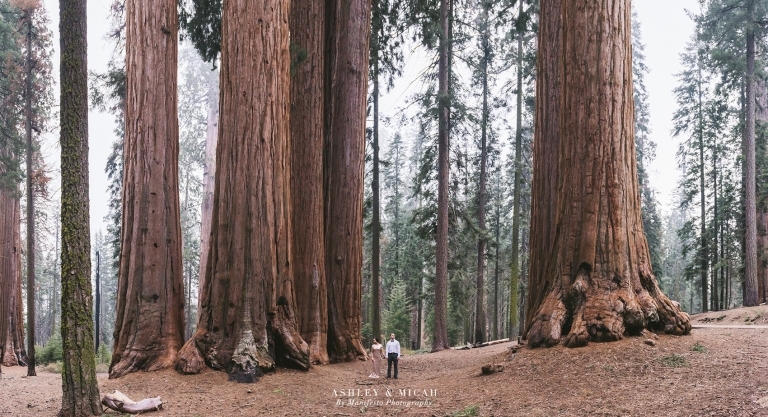 It’s both terrifying and awe-inspiring, standing in the midst of grand sequoia trees, some- like the General Sherman Tree-currently being the tallest living tree on earth. The stories these trees could tell! 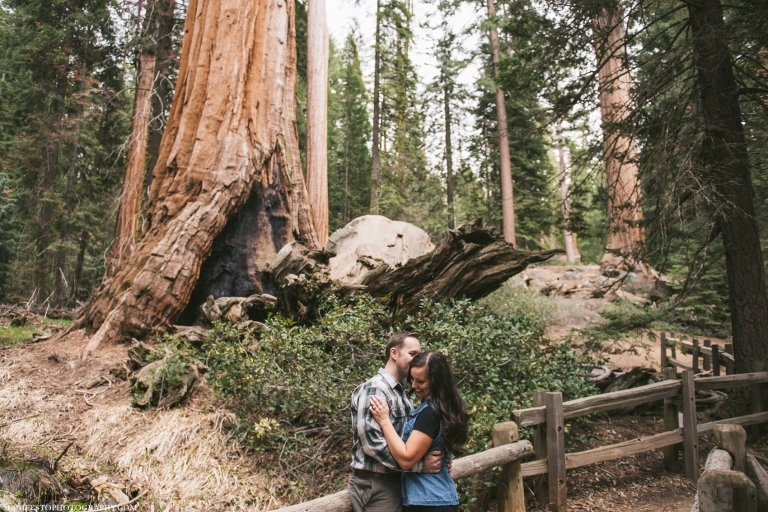 Hiking from top to bottom through Kings Canyon & Sequoia National Park with Micah and Ashley for their #travelwithManifesto destination engagement session was an adventure! We spent the day exploring the rugged landscapes around the park, strolling under canopies of redwood trees with their beautiful rusty red bark contrasting the deep green leaves. Once the sun started to dip below the horizon, we ended our day at a rocky outlook where Micah and Ashley held each other close, enjoying the moment while taking in the best sunset. Micah and Ashley, congratulations on taking the next step in your lives together! It was so much fun exploring the grandness of the Sequoia’s with you guys. Your sense of adventure and love for each other is inspiring. Looking forward to sharing your Joshua Tree National Park photos very soon! “From the beginning, working with Josh and Arica was simply amazing; we couldn’t have asked to find two better people to help capture our special day(s). Finding a wedding photographer is easily one of the most important decisions one can make while planning a wedding and after hearing such amazing reviews about their personalities and their work, we just had to meet them for a consultation. And just like everything we had heard, they were nothing short of wonderful and we knew we had to search no more for our wedding photographers. They were always very accommodating and available; our living in Michigan made meeting up difficult at times but when we were able, they welcomed us and even our crazy, sassy, and hyper dog (Hailey) into their home for our consultation! Arica being the animal lover she is, took to Hailey immediately and was great with her, even on our big day and Josh, he was so kind and patient with her even when she was sitting and just barking at him. We knew that they would be great to work with from this moment forward. 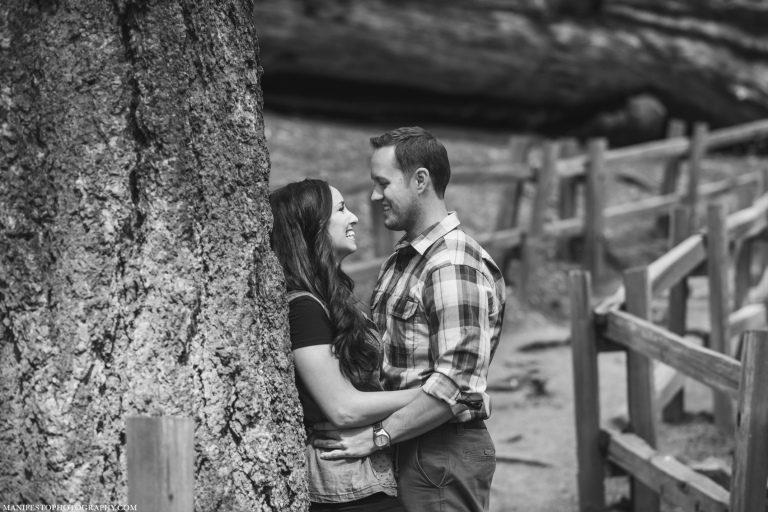 We also knew we wanted to travel for our engagement session/wedding photos and once the planning process began, Josh dove in head first and was great at researching ideas, bouncing location ideas off us and just listening to our concerns, wants and needs. We will say, every single one of our wants were met, Josh stopped at nothing to get us what we wanted and to make us happy. You know you’ve met the right person/photographer when they at times appear to be more excited about your wedding photo-shoots than you are! Overall, the planning process with J&A was great…we threw a lot of curve balls at the two of them as well but everything was handled super professionally and even compassionately with a lot of understanding. They were literally always a phone call away and especially when our trip got closer and closer Josh made himself available to plan out last minute details at crazy hours in the night/morning to accommodate my midnight shift schedule. When shooting, they have a way of making you feel comfortable as well.